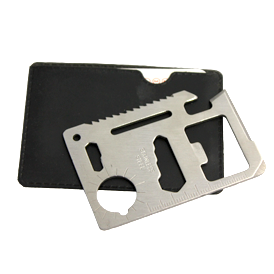 Be the hero (often) when you carry this 11 function credit card sized stainless steel multi purpose tool. Functions as can opener, knife edge, screw driver, ruler, bottle opener, 4 position wrench, butterfly screw wrench, saw blade, compass indicator, 2 position wrench, hole for key tag option. SV-0001: Screen imprint on tool; SV-0002: laser engraving on tool; or SV-0003: screen imprint on pouch. SV-0001 & SV-0002 with screened pouch, add 0.20 (C) plus 36.00 set-up. Additional colors 0.18 (C) plus 40.00 (G) set-up. Two weeks after artwork approval.